This is the type of stew mostly likely made by a fisherman after cleaning his catch. 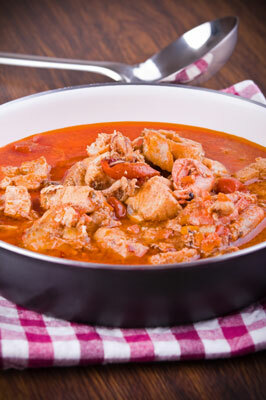 The base of the stew is a tomatoey fish stock made with the most flavorful parts of the fish that are usually not eaten, such as the head, fins, and bones. After all the flavor is extracted and the stock strained, you quickly poach choice pieces of fish and seafood in the broth. Heat the olive oil in a 6-quart saucepan over medium heat. Add the onions and garlic and cook until soft. Add the diced tomatoes and cook until most of the liquid evaporates. Add the fish heads, bones, tails, and fins and the parsley, basil, fennel, bay leaf, thyme, orange peel, salt, pepper, and water. Bring to a boil over high heat and cook for 30 minutes. Strain the soup into another saucepan, squeezing all the liquid out of the ingredients. Discard all solids. Season the soup with salt and pepper to taste. Bring to a boil. Add the fish pieces and cook for 5 minutes. Add the clams, mussels, and scallops and cook for 5 minutes longer. Place a couple of toasted bread rounds in 4 shallow soup bowls. Place some fish and shellfish in each plate. Ladle the soup on top of each and sprinkle with some of the minced parsley before serving.